You won’t find many reminders of World War II in Thailand. However, there are a few places where the history is clearly visible. Kanchanaburi is one of them. 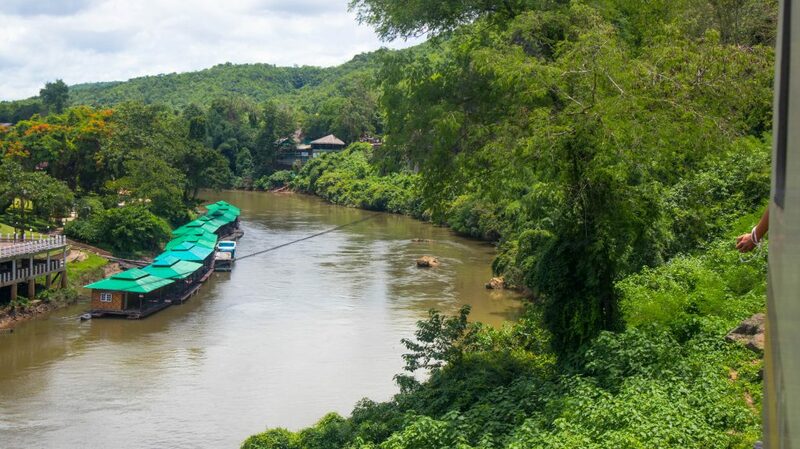 Kanchanaburi is home to the Bridge on the River Kwai – a steel construction built by the Japanese during World War II. The railway line that starts just around the corner from the bridge and runs through it stretches for 250 miles. It is known as the Death Railway. Nowadays, you can ride it through beautiful landscapes to a place called The Hellfire Pass. Both places are a painful reminder of the atrocities committed by people during the darkest times of our history. I remember when my dad watched the famous 50s movie The Bridge on the River Kwai. It used to be on tv quite a lot when I was a child. He loves war movies and I have no idea why out of so many films he watched at the time this particular one got stuck in my head. Only a few years ago I found out that the bridge was in fact in Thailand and I had been planning to go and see it ever since. This was not the only reason why I chose to go to Kanchanaburi. 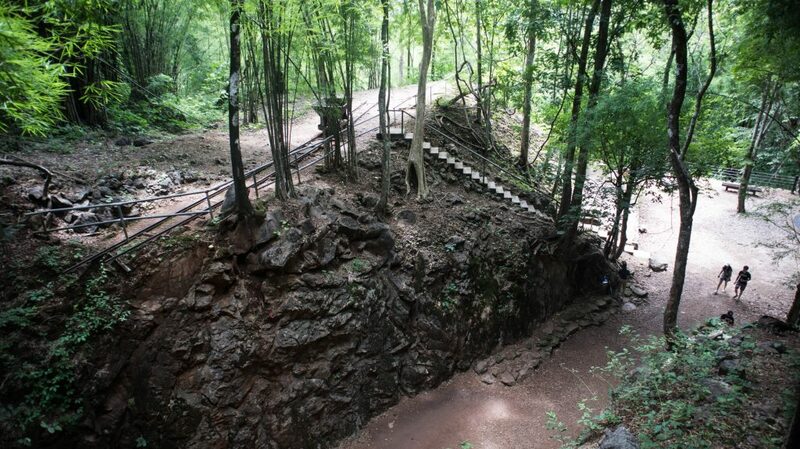 I really wanted to ride the Death Railway and see the Hellfire Pass, which were also recommended to me by other people, who have been there already. One of the reasons why people want to ride the train are the views. In 1942 the Japanese invaded Burma and took it over from the United Kingdom. They completely relied on the access to the sea to supply their forces in Burma. Unfortunately for them, this route was constantly attacked by the Allied forces. 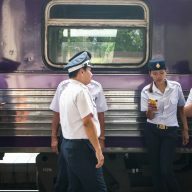 To avoid it the Japanese started building a railway, which was supposed to connect Bang Pong in Thailand with Thanbyuzayat in Burma. Around 180,000 to 250,000 Asian civilians and around 61,000 Allied prisoners were forced to work under extremely tough conditions. 90,000 of civilians and 12,000 of the prisoners of war died during that time. 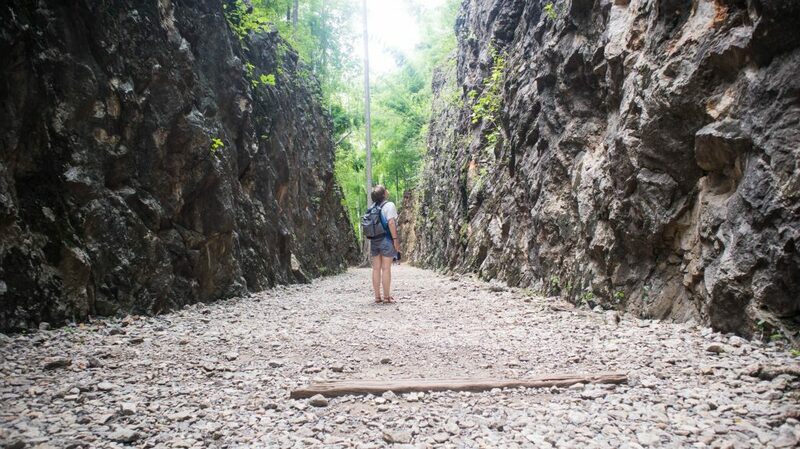 The Death Railway starts in Bangkok and finishes in Nam Tok near Kanchanaburi. It’s famous for its history, but most take it to admire stunning scenery and to experience a ride on an old, antique train. It’s hard to think about the victims of the war crimes when the most beautiful views are rolling outside your window. It changes when you get to the Hellfire Pass. The pass is an unfinished railway cutting, where thousands of people lost their lives while working in harsh conditions. 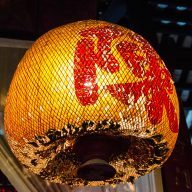 The name comes from the sight of the laborers working during the night. Their shadows and the torchlights resembled scenes from hell. Don’t have your own transport? You have no idea where to start when it comes to planning your trip? 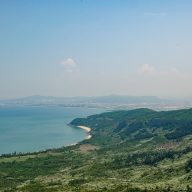 TakeMeTour connects tourists and local guides to create memorable and unique tours. 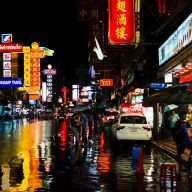 Check out their website for trips in Thailand and Asia. I got up early in the morning to walk around the area and to buy my ticket for the train before crowds of tourists could beat me up to it. The day was lovely. The sun was shining and the sky was blue. Perfect for a train ride. The train station in Kanchanaburi is tiny. 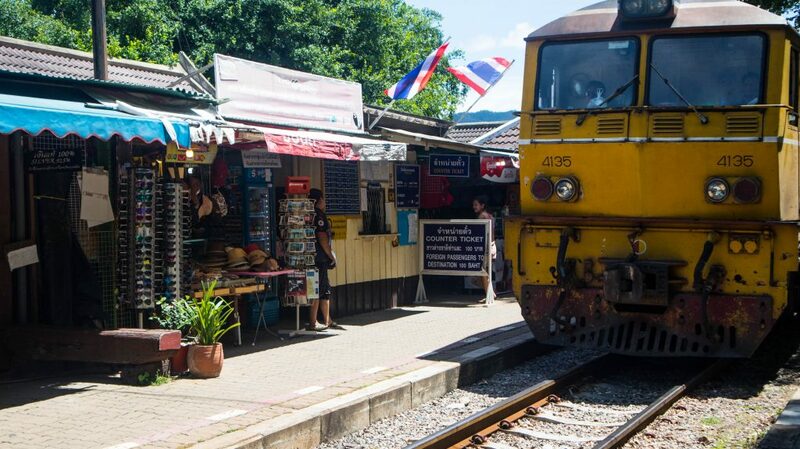 When an old, huge machine rolled onto the station in Kanchanaburi I was so excited. I had never been on such a vehicle before. I thought our Polish trains were old, but this-this was a relict of the past. This train is a relict of the past. I jumped on board and took a seat on a wooden, old-school bench. Unfortunately, these were reserved for tours and people, who paid twice as much for a ticket. I was asked to move to a different carriage and one of the staff kindly told me where to sit to get the best view. I sat on the train with some sleepy looking locals, who dozed off every now and then and didn’t care about the scenery. I, on the other hand, was amazed. I sat on the train with some sleepy looking locals. The whole way I was sticking my head out of the window really enjoying the ride. We passed villages and rice fields. The countryside looked so serene. But that was just the beginning. Almost at the end of the trip, we reached a cliff and the train slowed down to a minimum. With creaks and squeaks, we rolled on a side of a mountain with nothing to hold us except the old, ancient rails. Beneath us, the river flowed through the mountains. It was beautiful! The ride on the Death Railway is an amazing experience. It was hard to think about the people, who paid with their lives to build the Death Railway. It was hard to associate the route with the word ‘death’. 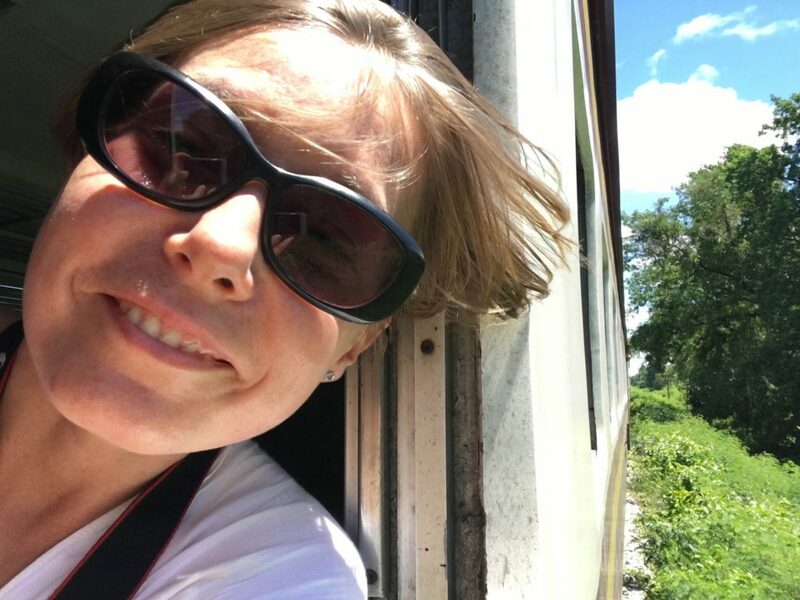 Before I jumped on the train I had been aware of its history, now I was only thinking of how lucky I was to have a chance to be there, to admire the views, to live through such an experience. I got off at Nam Tok with the other people. Here I had a choice to either go back straight away or see what’s in the area. As it is usually the case with me, I didn’t prepare much, so went up to a map and had a look. There were trekking routes and some waterfalls. I was chatted up by a freelance guide, who for 700 Baht offered to take me to the Hellfire Pass and back. The Pass is about 20 minutes drive from the Death Railway. On the way there you can stop at one of the waterfalls. I chose not to do that to have more time to see the historic place. I spent quite a lot of time walking The Hellfire Pass. I was dropped off at the gates and followed the signs. In the beginning, the staff made sure that I had some water and I was aware that the walk would take about 30-40 minutes. I wasn’t afraid of exercising as I love walking, but as soon as I hit the forest and the stairs going down, I realized why the staff was so concerned. The trek wasn’t so difficult, but the heat and the humidity made me breathe so fast and shallow and I sweated so much that after a while I felt a bit dizzy. I stopped a couple of times and pushed on until I reached a clearing. The Hellfire Pass is hidden deep in the forest. I was quite tired when I got to the end. Imagine how hard it must have been for the people who worked here. The heat, the lack of food, the lifting of the heavy rocks. Unimaginable suffering in unimaginable conditions. It really was hell for them. The Hellfire Pass doesn’t contain any special attractions. There are a monument and a few barrels to illustrate the hard labor the people here put into building the Death Railway. 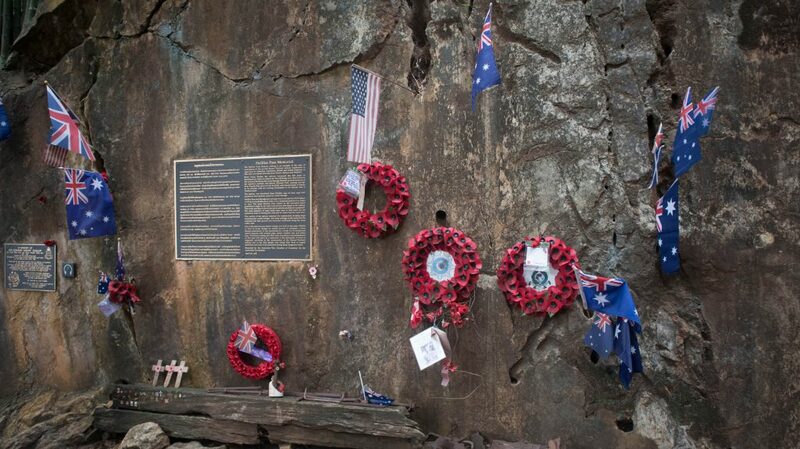 On the rocks, the descendants of the victims, many of them Australians, put memorabilia and cards to commemorate their ancestors and to thank them for their bravery and sacrifice. People leave flags and flowers to pay tribute to the victims. The place was quiet and it had a serious and mysterious aura around it. It was easy to imagine the torchlights and the people working on the tracks. You could almost see the horrific scene. I took my time there. Despite the heat and my tiredness, I walked up and down the track reading the cards left by families of those who died. I got back a little less enthusiastic about the train ride. The views were still stunning, but I just couldn’t enjoy them as much. You can easily do the trip by yourself. Buy your ticket at the station before the train arrives. 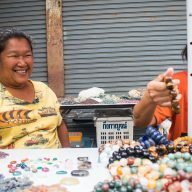 However, if you’re looking for a guide, then I recommend Take Me Tour, which is a great company that connects locals with tourists. I always use them and cannot recommend them enough. Have a look at their tours in Kanchanaburi. 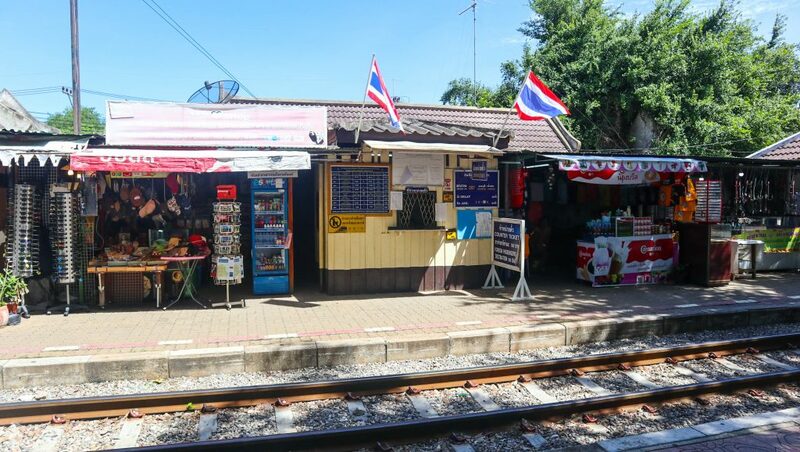 The station in Kanchanaburi is only a few meters away from the famous bridge. You can find the map here. 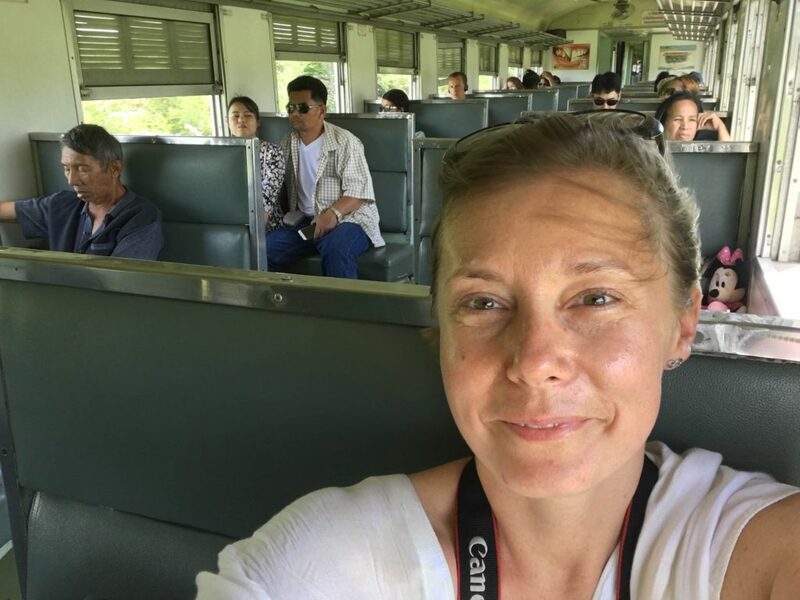 The train times from Kanchanaburi to Nam Tok: 6.07am, 10:35 am, 4:26 pm. However, the trains are usually quite late. The journey takes about 2 hours one way. For the best views sit on the left-hand side. You can take train back from Nam Tok, or you can take a taxi back in to the town. The tickets are available at the station 15 minutes before the train arrives. Cost: 100 Baht one way. Once you get to Nam Tok, you can take a taxi to the Hellfire Pass. I paid 700 Baht for a return private taxi. The entrance to the Hellfire Pass is free. You will get a map at the entrance. Don’t forget to take a lot of water with you and a mosquito repellent. 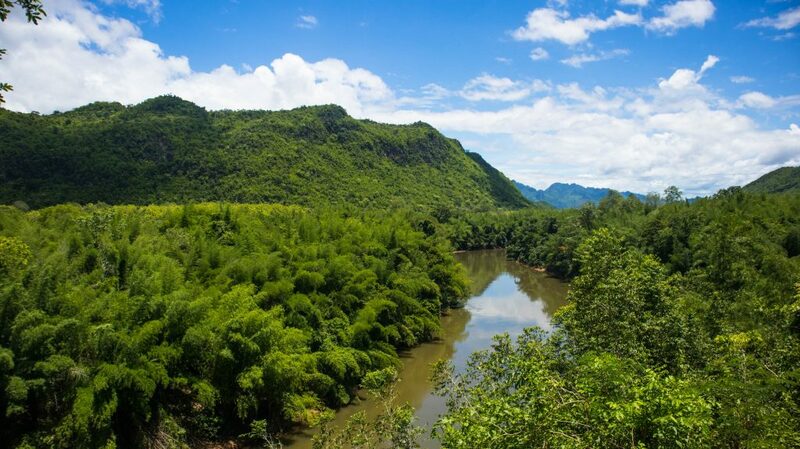 How to get to Kanchanaburi? The easiest way is to take a bus from Bangkok, which I did. It was difficult to find the right bus stop, but I did it in the end and it only cost me 100 Baht! To save yourself the hassle, you can use 12GoAsia, which I highly recommend for any bookings of transportation in this part of the world. Once you get to the station, you can take a taxi to your hostel for about 100 Baht. Most of the hotels are around the bridge and the station, so you can walk there very easily. I recommend staying in Kanchanaburi for at least 2 days. From there you can go back to Bangkok, or you can travel to Chiang Mai, Ayutthaya and other destinations in Thailand. 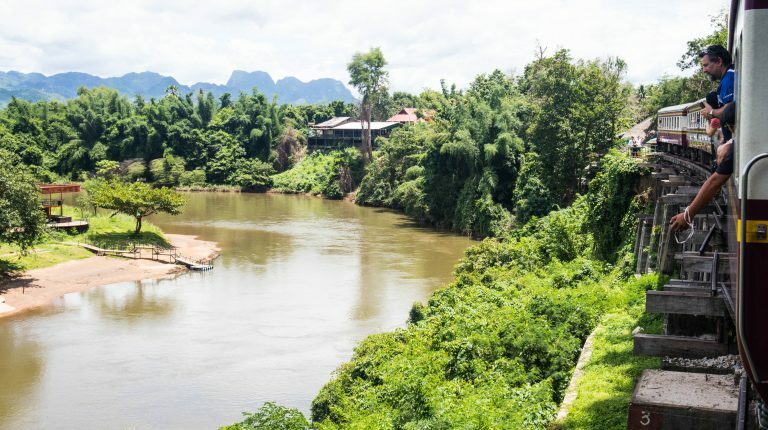 Where to stay in Kanchanaburi? Bamboo House Resort – one of the cheapest and the most charming places I stayed in. I chose a bungalow on a raft, which cost me only 3 Euros per night. The conditions were simple, but I really liked it. The resort also offers more luxuries options. Sky Resort – good location, clean rooms, and pleasant service. There’s even a swimming pool on the site. A very good place to stay while in Kanchanaburi. Princess River Kwai Hotel – this place is a little out of town and there are a few facilities around. However, it’s a perfect place if you want to chill and relax. VN Guesthouse – beautiful views over the River Kwai. Rooms have private bathrooms and wi-fi. The location is also very good.